Plaque on the side of the bandshell listing those who donated to the bandshell. ​In 2015, The Greater Milwaukee Foundation, in celebration of its 100th anniversary, presented $200,000 ​ for the renovation of the 50 year old utilitarian style bandshell located in five acre Cedar Creek Park in downtown Cedarburg. 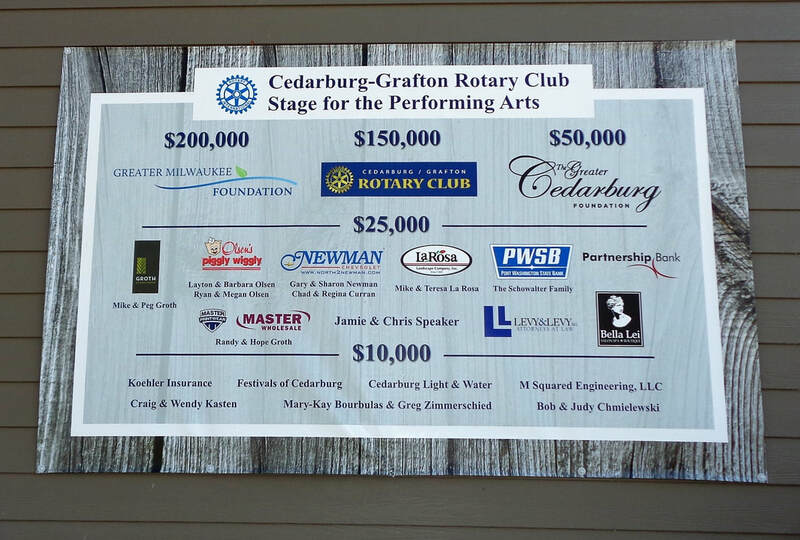 The Cedarburg-Grafton Rotary Club in its 50th year, committed to another $150,000 and launched a fundraising effort to help pay for the $625,000 project. The Greater Cedarburg Foundation funded $50,000, and the Cedarburg Parks and Recreation Department and the City of Cedarburg also participated in the funding. A wall listing those who donated over $10,000 is placed on one side of the bandshell along with a plaque dedicating it to Bandmaster William G. Loebel. Groth Design Group donated its services. Natural timbers and limestone native to the area are featured in the new bandshell. Now, larger bands are better accommodated and it is anticipated that theatrical performances will also use it. Renovations included an enlarged stage, an extended roof, storage space for musical equipment and all new electrical service and lighting. On Friday, June 17, 2016, the first concert was held in the new shell. Summer Sounds concerts are offered at the park on a regular basis. ​​The City of Cedarburg has two Wisconsin Official Markers erected in 1997, indicating the historical significance of the area. The first one tells of the "Origin of Cedar Creek", which had a drop of 80 feet in 2.5 miles, making it a natural for developing energy to drive the many mills. The second one is the story of the "Mills on the Creek" that were developed in 1844 by Frederick Hilgen and William Schroeder. ​Two historic mills have been designated on the National Register of Historic Places. German immigrants who settled in the area used native limestone in the construction of many of their homes and churches. The municipal buildings, museums and art galleries, and other buildings also use the stone. A plaque in the park tells of "The First 100 Years" in which Cedarburg celebrates that it is among 2,000 communities nationwide that own and operate its own utilities.